How could Dunkin’ create a new opportunity to further engage with fans in a unique way? Waze and Dunkin’ Donuts partnered to save consumers time both on the road and in line by connecting the Dunkin’ Donuts’ On-the-Go Mobile Ordering system to Waze. Before hitting the road, drivers simply searched for their closest Dunkin' location within Waze and tapped the “Order Ahead” button to launch the Dunkin’ Donuts in-app ordering experience for that store. 100% of Wazers are in the car and accessing technology to outsmart traffic. The campaign targeted drivers headed to work and consumers searching for “coffee” and “Dunkin’” on the app. 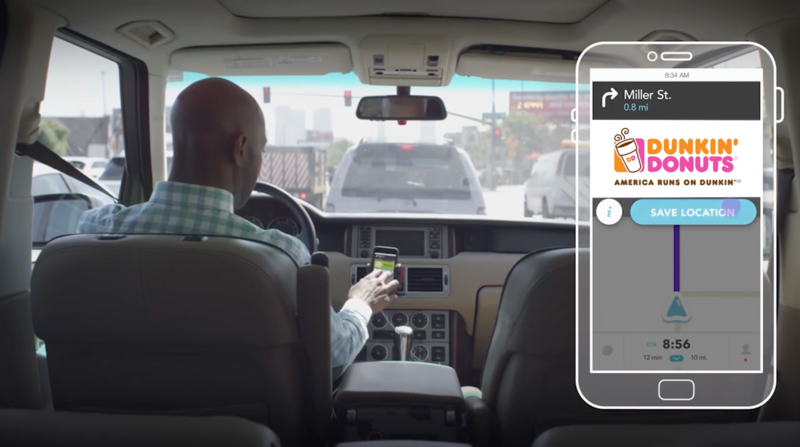 Dunkin’ Donuts and Waze worked in tandem to develop a first-to-market, deep-linking solution that connects an advertiser’s location on Waze to their own in-app ordering system. Waze pinned participating DD locations, delivered Zero-Speed Takeovers to drivers whose routes passed through participating store location radiuses, and accessed users’ in-app searches for “Dunkin’” or “coffee.” Dunkin’ ad creative asked users to save a how-to video to their Waze inbox to watch once they completed their drive.